← Noise Suppressors for Target Shooting or Hunting? Answer: Sorry, but Department of Fish and Game (DFG) staff will not come out to your house to remove or relocate rattlesnakes residing in your yard. However, if you can muster up the courage to deal with it yourself, you will not need a license to kill or trap it. If not, and you have no neighbors, friends or family members willing to help you move the rattlesnake, your best option will be to contact a professional pest control service to do it. For the future, here are some helpful hints from DFG Associate Wildlife Biologist Nicole Carion on how to discourage rattlesnakes from taking up residence near your home. Don’t let feed from bird feeders overflow and build up on the ground to attract rodents. Don’t allow high rodent populations to occur near your house. 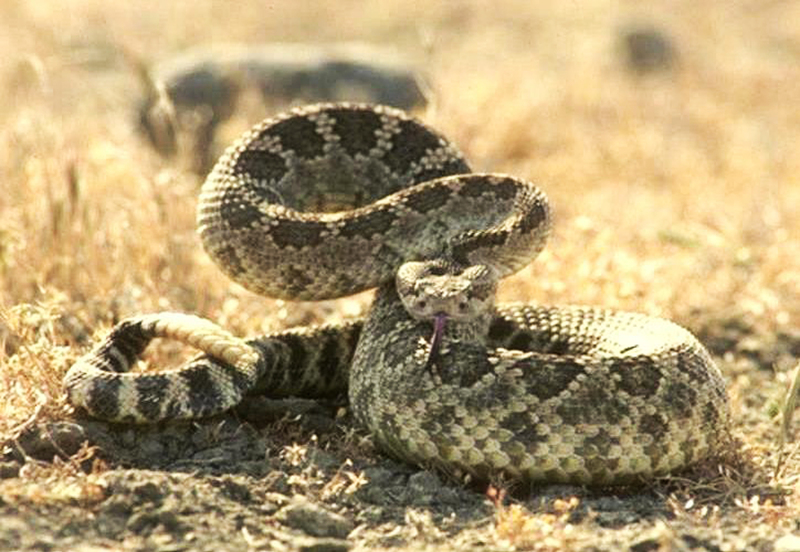 Rattle-snakes are great population managers for ground squirrels and other rodents, so try to keep their numbers down. Always be mindful when working in or around wood or rock piles. Don’t stack these materials near your house. Also, for the safety of your pets, remember to keep them indoors, especially at night. Answer: It is legal to import the redtail surfperch taken in Oregon in excess of California’s limit of 10, but you cannot take any redtail in California until you have fewer than 10 in your possession (that means either consume them or give away the extra). Prior to bringing them into California you will need to fill out a Declaration for Entry form. They are available online at www.dfg.ca.gov/enforcement/docs/declaration_form.pdf or in the 2011 Ocean Sport Fishing Regulations booklet on page 79. Answer: The bear problem in the previous Q&A concerned a “nuisance bear” that was essentially looking for an easy meal by raiding unsecured garbage cans for discarded human food. The problem you describe, though, is more serious. According to DFG Bear Program Manager Marc Kenyon, if the bear is immediately threatening human safety by chasing someone, attacking someone or even entering an occupied dwelling – essentially a “nuisance bear” that has elevated itself to a “public safety animal” – then the bear can be killed immediately without a tag or permit. Also, if a bear is discovered while in the act of injuring, harassing or killing livestock (including honeybees, oddly enough) or a pet, then the owner or tenant of the land or property may legally shoot the bear immediately without a tag or permit (Fish and Game Code, section 4181.1). They will then need to report the killing within 24 hours to DFG. However, in any situation where you believe a wild animal is threatening human life or safety, immediately call 911 or your local law enforcement agency. They are equipped to respond to such situations and in many instances can provide a much faster response time. Question: I saw a man fishing with a remote-controlled helicopter and he caught a fish with it. Is this legal or not? Answer: It is legal as long as the remote-controlled vehicle is used only to move an angler’s line around while the angler maintains control of the line attached to the terminal tackle. This entry was posted in Bag Limits/ Possession, Fishing, Methods Of Take, Nuisance Animals & Pests, Wildlife Encounters and tagged bears, fishing methods, fishing tackle, freshwater fishing, ocean fishing, rattlesnakes, regulations, reptiles, snakes. Bookmark the permalink.